Deeply concerned about the number of military veterans who take their own lives at rates higher than that of the general population, The American Legion, the nation’s largest organization of wartime veterans established a Suicide Prevention Program under the supervision of its TBI/PTSD standing committee, which reports to the national Veterans Aﬀairs & Rehabilitation Commission. The TBI/PTSD Committee reviews methods, programs and strategies that can be used to treat traumatic brain injuries (TBI) and post-traumatic stress disorder (PTSD). In order to reduce veteran suicide, this committee seeks to inﬂuence legislation and operational policies that can improve treatment and reduce suicide among veterans, regardless of their service eras. 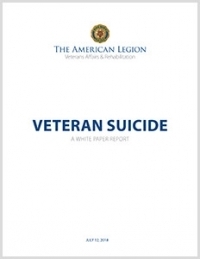 This white paper report examines recent trends in veteran suicide and their potential causes and recommends steps to address this public health crisis.